The AK47 Chest rig had not had a major redesign for years until we revolutionize it. We are revolutionizing it again with GRID. GRID is our advanced laser cut system made from ACRONYM. Grid allows us to reduce weight and lower the profile. It replaces the molle webbing while maintaining molle pouch compatibility. American ingenuity has improved the AK47’s accuracy, quality and features over the past few years. We have worked hard to keep up with the weapon’s evolution by adding GRID to our AK47 chest rig. Let’s take a quick look back at the history and design consideration we used to build the first AK47 Chest rig. Our AK47 rig revolutionised the way AK47 magazines are carried today. 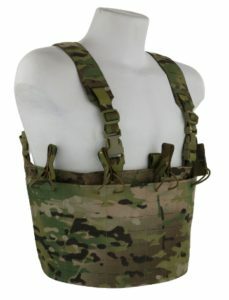 At the time, most of the AK47 chest rigs on the market were based upon the Chinese Chicom or Russian Lifchik that supported 3,4 or 6 magazines. The 6 magazine design is usually designed around three double stack pouches. When a magazine is removed the other gets really sloppy. Our rig eliminates the sloppiness. Why five mags? five mags allows for a light combat load. Five in the chest rig and one in the weapon. Five side-by-side mag pouches allows access to the end mags without wrapping too far around the body. This design lead to the use of the elastic bungee cord pull-tab that secures each mag and eliminates any sloppiness. 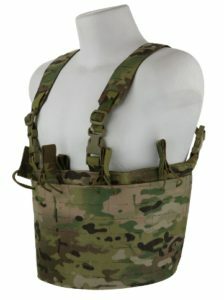 The advances in chest rig design had mostly taken place around the AR magazine used by US and NATO forces. The small elastic pull-tabs work great for the AR magazine, but not so great with the larger curved AK mag. We designed an over sized pull-tab that takes advantage of the curved mag design and secures the mag in the mag pouch. Not working against the mag but with it. 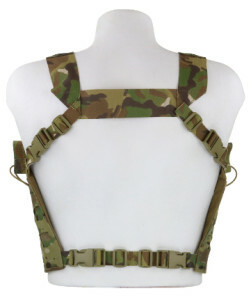 The H-harness has become our only harness available on our chest rig line. Feedback from our clients and our own field test have demonstrated the H-harness is a more comfortable and stable harness system. 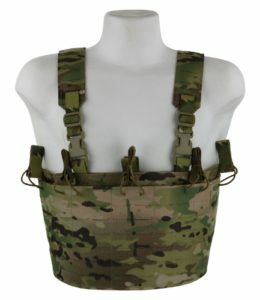 Currently the AK47 chest Rig GRID is only available in Multicam.